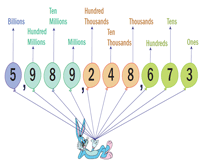 It is imperative for students of Grade 4 and Grade 5 to ace this final compilation of place value charts-billions to move ahead to other math topics. 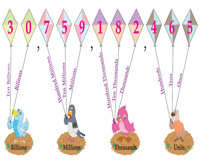 Pin up all the vibrant charts on the bulletin board to guide children grasp place value of multi-digit numbers. Download our templates to suit your teaching needs. Pin up or laminate these eye-catching charts illustrated with looney tunes and other funny animals in the classroom. 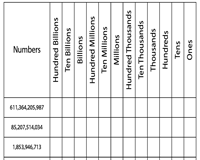 Assist students to distinguish the place values for the 10-digit numbers (billions) displayed here. 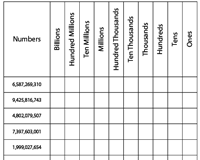 Download these engaging print-ready charts to teach learners who may have trouble identifying the place values of large numbers up to ten billions. 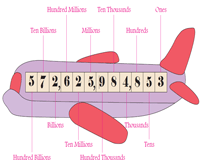 Employ our colorful theme-based place value charts to get students to recognize place value of hundred billions. 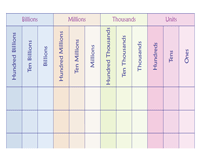 The poster depicts the entire progression of place values from ones to hundred billions. Print and distribute these blank charts which form the ultimate tool in gauging a child's comprehension of place values ranging from ones to hundred billions. Posters are available in both color and monochrome. Worksheets are classified into billions, ten billions and hundred billions, which offer learners ample practice. Determine the place value of each digit and write the numbers in the blank spaces provided. Use this assortment of worksheets to identify place values for 10-digit, 11-digit and 12-digit numbers. Fill in the place values in the blank spaces assigned. Validate your responses with the answer keys.